Navigating Artificial Intelligence workshop is the first in a series of AiLab’s hands-on workshops on AI, emerging technology and future jobs. AiLab provide private workplace workshops that are run globally and can be tailored to your needs. To make a private workshop enquiry, please use the form at the bottom of the page or call us on +61 (0)8 8464 0787. Navigating Artificial Intelligence is an introduction into the exciting world of AI. During this workshop, Dr. John Flackett explores the field of AI and what has driven its explosion into the mainstream technology sector in recent years. Learn how AI tools and techniques are being used across a range of businesses and government services. John also busts some of the AI myths and explains how companies might start employing AI systems. This 4 hour workshop is for groups of 5 or more (max number applies) and is suitable for beginners. What is AI and why does it matter? What problems suit AI solutions? Hands-on experience with training an AI system. Ability to recognise if a problem is suited to an AI solution. Insights into managing the unique aspects of an AI project (data, policy and talent). Business cards (to share with other workshop participants). Dr. John Flackett is passionate about Artificial Intelligence and regularly presents at events and runs AI workshops around the world. With 20+ years of AI experience, John has worked in a wide range of industries and AI has been an integral part of John's career via research, business and education. John achieved a PhD in Artificial Intelligence (Machine Learning & Natural Language Processing) in 2005 and was previously a senior academic for 10 years, lecturing in masters and undergraduate Artificial Intelligence and undergraduate Computer Studies and Software Engineering at a UK university. Please visit John's Bio and Media/Talks pages to find out more, including John's interviews and publications. For full details on this workshop or to make a booking, please make an enquiry using the form below or call us on +61 (0)8 8464 0787. This workshop and its content is copyright to koolth pty ltd & AiLab © 2019 and may not be reproduced. How did you hear about AiLab? Navigating Artificial Intelligence workshop is the first in a series of AiLab’s hands-on workshops on Artificial Intelligence, emerging technology and future jobs. Number: Groups of 5 or more. Max number applies. AiLab workshops can be tailored to your needs! 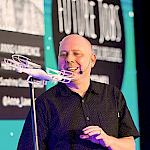 Book John for your next AI workshop, event, convention or conference. "AiLab will help filter out the noise and fact-check technology updates and resources, as well as organise and facilitate workshops and events to help companies and governments to understand Artificial Intelligence and the impact of these hi-tech systems better. Our aim is to bring AI into the mainstream and help as many people as possible navigate the world of AI."